Ming-Chi Kuo was one of the first analysts to predict the iPhone weak Q418 iPhones cutting estimates by 20% in mid-December, largely due to weak Chinese demand for iPhone XS and iPhone XR. With a new TF Industries report out last week, he said that the ‘worst is soon over’ and predicts that iPhone shipments beyond March will be higher than market consensus. Kuo says that the market is expecting 2019 iPhone shipments of around 180 million units at the high end. However, he is sticking to his December estimates and maintains the 188-192 million forecast. Kuo says calendar first quarter iPhone sales will be in the 36-38 million range. The impact of the trade-in program has boosted demand in non-Chinese markets. For calendar Q2, Kuo expects iPhone sales to be approximately flat quarter-over-quarter, in the 34-37 million range. This represents a 15% Y/Y decline, an improvement over the 29% drop predicted for Q1. Kuo expects iPhone shipments in the second half of the year to recover to be mostly flat compared to 2018, with the launch of the new iPhone series in the fall. Kuo foresees strong replacement demand, positive impact of trade-in programs and market share gains in European regions. Apple has increased its expenditures on research and development recently, spending $3.75 billion on R&D during Q4 2018compared to just less than $3 billion during Q4 2017—a year-over-year increase of $750 million. One area of technology where this investment may pay off will likely be flexible screen technologies. This includes innovations in elastic substrate layers serving as the circuitry for future iPhones and the continuing development of organic light emitting diode (OLED) technologies with flexible advantages of the flexible characteristics of OLEDs by incorporating the OLED technology in a flexible substrate. ​The use of OLEDs in flexible input-output devices is discussed within U.S. Patent No. 9841548,titled Electronic Devices with Soft Input-Output Components (pictured left). 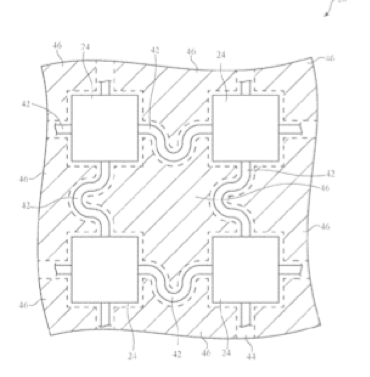 Issued to Apple in December 2017, it discloses an apparatus using an elastomeric substrate layer to form a display for a device with integrated sensors and haptic output. The claimed device would use serpentine signal paths running between electrical components via solder pads that are used to attach components to the substrate layer. The serpentine shapes of the signal paths help to accommodate the stretching of the substrate layer. ​The use of force sensors to detect user inputs via flexible device interfaces is disclosed by Apple’s U.S. Patent No. 10088927,titled Electronic Devices with Flexible Displays (pictured right). It discloses an electronic device that has a flexible display such as an OLED screen that can be deformed in a way noticeable to a user, yet the device remains operational. Such an electronic device would include a flexible substrate and an array of display pixels formed on top of that substrate. Under a portion of the substrate, a force sensor gathers user input by sensing a localized deformation of the substrate. While this patent does not describe a fully foldable smartphone, it does disclose a method in which flexible display technology can be utilized. ​The patent protects an electronic device in which first and second housing portions are coupled with a flexible hinge and a flexible display is mounted to both housing portions. The flexible hinge allows one housing portion to rotate relative to another and also allows for a support structure that can be made of a shape memory alloy. The patent discusses flexible display technologies, including OLED, that are capable of allowing a display to be bent in a way that’s not possible with liquid crystal displays that are set under rigid glass. The global market revenue for flexible display shipments increased from $3 billion in 2015 to $8.7 billion in 2018and by 2022 that figure is expected to grow to $15.6 billion, according to online statistics portal Statista.com. Market intelligence firm Mordor Intelligence recently forecasted that more than 35 percent of smartphone shipments would incorporate OLED screens by the end of 2020. Global technology research firm Technavio firm predicts that the global market for flexible displays will increase at a compound annual growth rate (CAGR) of 47 percentbetween 2018 and 2022. With its OLED innovations, Apple is clearly showing its interest in being a major part of the flexible device display transition that will be occurring in the near future.